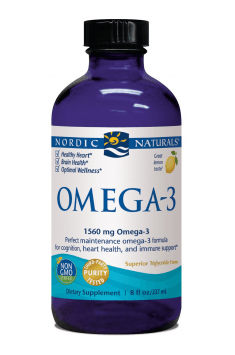 Nordic Naturals Omega-3 are high-quality essential unsaturated omega-3 fatty acids in a liquid form. Omega-3 acids are: eicosapentaenoic acid (EPA) and docosahexaenoic (DHA), whose positive effects on the functioning of the entire organism has been confirmed multiple times by scientific research. One bottle contains 8 oz. (237 ml) of delicious lemon-flavoured liquid. Eicosapentaenoic acid (EPA) and docosahexaenoic acid (DHA) are essential acids, which means that they must be delivered to the organism from the outside. Although the organism has the ability to synthesise EPA and DHA from alpha-linolenic and linoleic acids respectively, the efficiency of the enzymes desaturase and elongase responsible for that process is very low. Efficient communication between neurons and their immunity to harmful substances depend on the integrity of the cell membrane, which consists of phospholipids. DHA constitutes 60% of all phospholipids contained in the cell membrane and is essential to the normal development of the brain. Research shows that supplementation with DHA delays the occurrence of age-related disorders of brain function and reduces the risk of a stroke. The use of DHA has a positive effect on cognitive functions, such as memory, reaction time and the capacity of working memory, as well as regulates the mood and has an antidepressant effect. A well-functioning cardiovascular system is essential for many processes, including proper distribution of oxygen and nutrients in the organism. EPA helps to improve the markers indicating the condition of the circulatory system, such as: triglycerides, total cholesterol, low-density lipoproteins (LDL), high-density lipoproteins, arterial blood pressure, and homocysteine. Thanks to that, omega-3 acids reduce the risk of excessive cholesterol deposition in arteries, which results in inhibited blood flow and increases the risk of ischaemic heart disease. Scientists believe that chronic inflammations in the organism are highly dangerous for health and might indicate many disease entities. Omega-3 acids have powerful anti-inflammatory properties: they reduce the level of pro-inflammatory cytokines, such as interleukin 6 (IL-6), homocysteine, or tumour necrosis factor alpha (TNF-α). They also stimulate the process of autophagy, that is the mechanism of removal of damaged or worn-out tissues before the occurrence of their complete damage and the death of the cell. Metabolic disorders manifesting themselves through high blood pressure, high glucose and triglyceride levels, or insulin resistance can lead to serious diseases, such as type 2 diabetes or atherosclerosis. Omega-3 acids help to reduce abdominal fat, which is another marker indicating the metabolic syndrome. The compounds also have a positive effect on the process of adipose tissue reduction and help to maintain healthy metabolism. An efficient immune system protects the organism from infections and dangerous diseases. Omega-3 acids mobilise the immune system, increasing the levels of B lymphocytes and the production of natural killer cells. Moreover, supplementation with omega-3 acids can inhibit the functioning of the immune system in people with autoimmune diseases, when the system mistakenly considers its own tissues dangerous and starts destroying them. To sum up, Nordic Naturals Omega-3 is a supplement in a comfortable, lemon-flavoured liquid containing omega-3 acids obtained from sardines and anchovies. Essential unsaturated fatty acids have a positive effect on the health and functioning of the organism, they are crucial for the normal development of a foetus and the integrity of cell membranes. The benefits of using omega-3 acids will also be appreciated by people with a distorted lipid profile and another very common condition these days, that is the metabolic syndrome. Take one teaspoon a day, with food or as directed by your doctor or pharmacist. Because of their multitude of health benefits, omega-3 acids are recommended for everyone, particularly because the organism cannot synthesise them on its own, and the transformation of other acids to EPA and DHA is not efficient. For health-improving properties, it is recommended to take 1000-1500 mg of omega-3 acids a day. Omega-3 acids are very susceptible to oxidation when exposed to light, so they should be stored in a dark area and kept away from sunlight and artificial light. The preparation should be stored in a refrigerator and used within 3 months from opening. Nordic Naturals is a company established in 1995. Its beginnings were characterised by a smaller range of products limited solely to fish oil; these days, there is a much wider range of health-enhancing dietary supplements offered by the company. The founder of the company is a Norwegian Joar Opheim, who started Nordic Naturals in response to the low quality of products with fish oil available at that time. Products of this brand are given the Friend of the Sea certificate, which guarantees that the fish oil is obtained from environmentally friendly, responsibly managed sources. Preparations offered by this company are also thoroughly tested in terms of purity. Natural lemon flavor, alpha tocopherol, rosemary extract (as a natural preservative). The product does not contain gluten, milk derivatives, artifical colors or flavors. Apigenin from grapefruit. Promotes a healthy prostate and prevents cancer.